The Marvel anti-hero returns Friday to carve a new trail of blood and wisecracks, making his own mark in the presumed summer of "Solo." Deadpool is leaping back into the movies. Ryan Reynolds revealed recently that a crack about Disney proved to be just about the only thing 21st Century Fox wouldn't allow in the endlessly profane and violent original "Deadpool" flick. So when Disney announced its bid to take over the Fox movie and TV empire late last year, Reynolds tweeted a photo of a Disneyworld security guard leading Deadpool out of the Magic Kingdom. The caption, in keeping with most of the dialogue that pulsed through the 2016 film, proved decidedly R-rated. Now "Deadpool 2" oozes to life Friday, arriving smack between Disney's "Avengers: Infinity War" and its upcoming "Solo: A Star Wars Story." Deadpool doesn't easily fit in – not with the usual summer blockbuster fare, nor with the X-Men in the Fox-controlled stable of Marvel characters or the more expansive Disney edition of the Marvel Cinematic Universe. Still, the haunted anti-hero, who shocked many with his record-breaking solo bow in early 2016, might have the times on his side: He returns to a world that's taken great strides toward matching his cynicism level. Nothing's sacred in Deadpool's dank life, as evidenced by the relentless bloodshed and unprintable wisecracks that elevated the original flick to the largest worldwide gross ever for a R-rated film. Reynolds' Wade Wilson, the mercenary with the face not even a mother could love, talks as fast as Spider-Man, but spews patter Aunt May could never stomach. 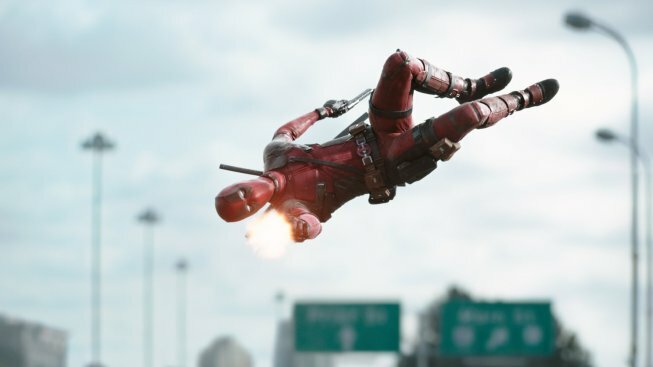 The swords and bullets fly at a similar speed, making for, by one reckoning, 55 deaths in one hour, 48 minutes (or roughly one every two minutes) in "Deadpool." Deadpool is hard to like, but he makes it easy to hate yourself for laughing through the mayhem. Perhaps his lurid appeal rests in his differences – and not just his frequent breaks through the fourth wall with irreverent, self-referential humor. He's unlike any of the major movie superheroes of the moment. Deadpool makes Batman, DC's brooding Dark Knight, seem like a glass half-full type. We'll see whether the box office cup runneth over for "Deadpool 2" amid the current Avengers reign and on the eve of the presumed summer of "Solo." The performance of "Deadpool 2" also could signal what plans, if any, synergy-happy Disney has for the Marvel universe's biggest sinner, should its merger with Fox close next year as expected. Deadpool doesn't seem like the Avengers type, though he embodies the darker, vigilante connotations of the all-star crime-fighting group's name. Still, he's full of surprises, even if he's not what most people would think about when wishing upon a star.